Funktion-One impresses with perfect PA for all four stages at France’s biggest electronic music festival. Photo by 432 Productions. 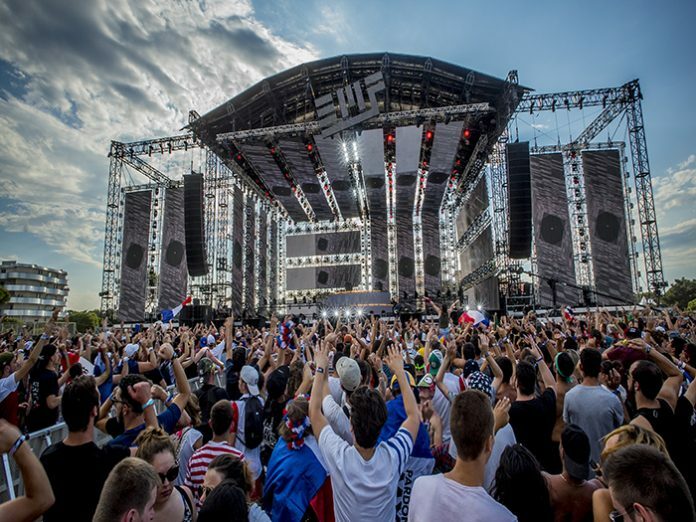 For the 2018 edition of Electrobeach, which took place from 12-14 July, organisers broke new ground by employing Funktion-One sound systems on all 4 of its stages. Held in the port town of Barcarès on France’s southern coast, Electrobeach is the country’s largest electronic music festival, featuring more than 100 DJs and hosting around 100,000 people over its 3 days. To meet the needs of such a large-scale event, Funktion-One specialists from across France and beyond came together to work on the festival. Heading up the project was Concept Group, based in the south of France, who in turn brought together Solution One from Montpellier, Remote from Paris and Think! AV from the Netherlands – each providing the equipment and expertise required to ensure this year’s sound systems would surpass all those that had come before. Further augmenting this super-group of suppliers was a crack team from Funktion-One HQ, including company co-founders and R&D masterminds Tony Andrews and John Newsham. Leading the charge on the Main Stage, was a Funktion-One Vero large format vertical array. Though it shares the same easy-to-deploy convenience that has made line arrays so popular, Funktion-One Vero works on a completely different set of acoustic principles – delivering a clarity and efficiency that proved to be an unprecedented listening experience for organisers and concert-goers alike. The Funktion-One Vero system utilises a 3×15 mid-bass horn-loaded cabinet along with dedicated 90° and 60° mid-high. These can be configured in any arrangement to perfectly suit any given environment. The customisable nature of the Funktion-One Vero system delivered a number of advantages that proved particularly useful on Electrobeach’s Main Stage. An additional benefit was in the incredible throw achievable with Funktion-One Vero. Festival organisers wanted to avoid the use of delay towers, while at the same time ensuring good quality coverage all the way back to the huge landlocked steel boat that sits on the beach some 120m away – this was achieved effortlessly. As well as behaving completely naturally (with no onboard system EQ), the Main Stage sound was unaffected by the coastal wind. “We’re noticing that, despite the site being really windy, we’re not getting the normal phasing problems because it’s not summing in the near field,” explains Andrews. The Mainstage hangs comprised 10 x Funktion-One V60 (mid-high loudspeaker providing 60° horizontal), 12 x Funktion-One V315 (mid-bass horn loaded loudspeaker) and 8 x Funktion-One V90 (mid-high loudspeaker providing 90° horizontal coverage). 32 Funktion-One V221 subs and 8 Funktion-One V132 super subs were stacked in front of the stage, with 4 Funktion-One Evo 7/TH used as out fills and 2 Funktion-One Evo 7 for centre fills. 22 Lab.gruppen PLM amplifiers powered the system. For the remaining three stages Funktion-One Evo systems energised each audience. On the Techno Stage, the system comprised 6 Funktion-One Evo7T, 6 Funktion-One Evo7TH, 6 Funktion-One Evo7TL215, 2 Funktion-One Evo7TH infills, 10 Funktion-One F121, 4 Funktion-One F132 and PSM318 monitors. On the Beach Stage 4 Funktion-One Evo6E, 4 Funktion-One Evo6EL, 8 Funktion-One F124 (configured in a compact delta array) and PSM12 Monitors with Minibass 212 were used, while over on the Hardstyle Stage 4 Funktion-One Evo7T, 2 Funktion-One Evo7TH, 2 Funktion-One F315, 12 Funktion-One F121 and 6 Funktion-One BR221 were on duty.